Multi-channel communication of different systems need to consider the combined information from different channels, the transmission of signal through a fiber optic link and the separation of a single channel receiver prior to routing to their destination. So the application of IO in this field is to provide optical multiplexer, the method of modulation and routing. These different functions may be related to the beam split, switch, modulators, filter, the source and detector. But now this article will focus on the modulator. Although limitations imposed by direct current modulation of semiconductor injection lasers currently restricts the maxium achievable modulation, however, more than 100 GH2 have been demonstrated. Furthermore, with most injection lasers high-speed current modulation also creates undesirable wavelength modulation which imposes problems for systems employing WDM. Thus to extend the bandwidth capability of single-mode fiber systems, there is a requirement for high-speed modulation which can be provided by IO waveguide intensity modulators. In addition a large variety of predominantly electro-optic modulators have been reported which exhibit good characteristics. For example, an important waveguide modulator is based upon a Y-branch interferometer which employs optical phase shifting produced by the electro-optic effect. When the electric field is applied transversely to the direction of optical propagation. Integrated optics and photonics a lithium niobate strip waveguide phase modulator designed for operation at a wavelength of 1.3 μm is 2 cm long with a distance between the electrodes of 25 μm. The electro-optic property can be employed in an interfero-metric intensity modulator. The device comprises two Y-junctions which give an equal division of the input optical power. With no potential applied to the electrodes, the input optical power is split into the two arms at the first Y-junction and arrives at the second Y-junction in phase giving an intensity maximum at the waveguide output. This condition corresponds to the on state. Alternatively, when a potential is applied to the electrodes, which operate in a push-pull mode on the two arms of the interferometer, a differential phase change is created between the signals in the two arms. The subsequent recombination of the signals gives rise to constructive or destructive interference in the output waveguide. Hence the process has the effect of converting the phase modulation into intensity modulation. A phase shift of π between the two arms gives the off state for the device. High-speed interferometric modulators have been demonstrated incorporating lithium niobate waveguides. A 100 GHz modulation bandwidth has been reported for an interferometer employing a less than 5V on/off voltage. Similar devices incorporating electrodes on one arm only may be utilized as switches and are generally referred to as balanced bridge interferometric switches. 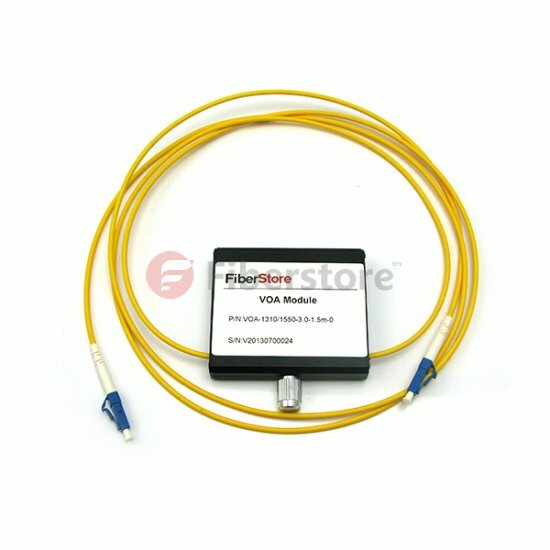 An interferometric modulator basedon planar waveguides has also demonstrated performance as an optical power attenuator This device, referred to as a variable optical attenuator (VOA), is useful in wavelength division networks. In its simplest form the VOA attenuates A Y-junction interferometric modulator based on the Mach–Zehnder interferometer. Integrated optics and photonics optical signal power to a desired level which may be required for controlling optical power levels prior to optical amplifiers and receivers, or for channel equalization. A typical range of attenuation obtained from such a VOA is 0 to 20 dB while specific devices can provide higher attenuation up to 38 dB. VOA providing this high level of attenuation can be used, for example, to block a WDM channel. Useful modulators may also be obtained employing the acousto-optic effect. These devices, which deflect a light beam, are based on the diffraction of light produced by an acoustic wave traveling through a transparent medium. The acoustic wave produces a periodic variation in density along its path which in turn, gives rise to corresponding changes in refractive index within the medium due to the photoelastic effect. Therefore, a moving optical phase diffraction grating is produced in the medium. Any light beam passing through the medium and crossing the path of the acoustic wave is diffracted by this phase grating from the zero-order into higher order modes. An IO acousto-optic deflection modulat prague consists of a piezoelectric thin film on the substrate of the optical waveguide. Such as titanium in the surface of the lithium diffusion or spread outward form. An acoustic emission is parallel to the waveguide to form a surface acoustic wave (SAW), most of which focus on an acoustic wave energy long depth within the scope of the surface. Wave is made up of including parallel electrode is deposited on the substrate of fork refers to the electrode system. It is guided by thin film waveguide interaction and SAW a light beam deflection, because both light and acoustic energy. The deflection of the beam of light modulator of waveguide depends in part on the width of the power generation efficiency and SAW, which is also a limited amount of interaction between the length of the device. Although the diffraction efficiency are generally lower (less than 20%), the diffraction on/off ratio is very high. As a result, these provides effective switching devices and the amplitude or frequency modulator. Optical Attenuator optical amplifiers, optical multiplexer, variable optical attenuator. permalink.